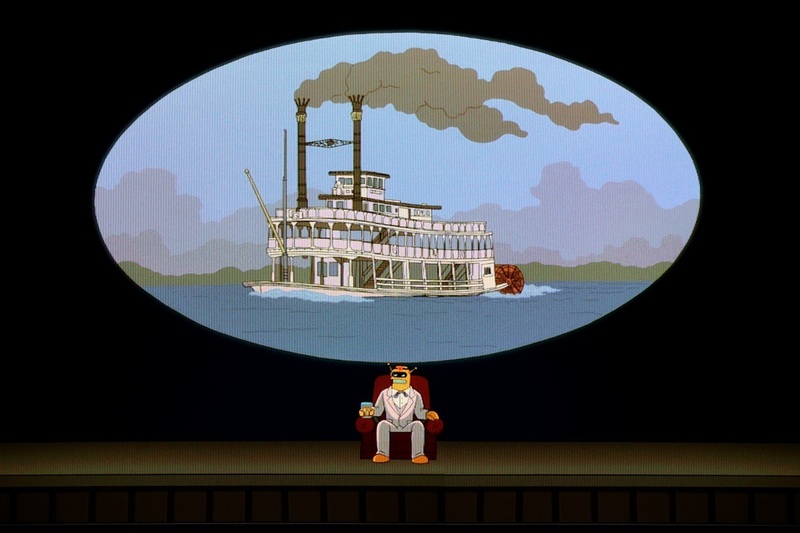 Disneyland's "Mark Twain" steamboat represented in FUTURAMA's episode "CALCULON 2.0"
In one sequence of "CALCULON 2.0" the ALL MY CIRCUITS soap opera robot-actor-star "Calculon" performs a one man show at the "Shubot Theater" (a take-off on the name of the Shubert Theatre in New York City) as HAL 9000, portraying the robot character HAL 9000 from Stanley Kubrick's 2001 - A SPACE ODYSSEY (1968). The premise of Calculon's performance was intended in part to be a parody of Hal Holbrook's one man show "Mark Twain Tonight." "What's that, old friend? My life story? Well, heck, why not? Pull up a monolith and make yourself cozy. I first came online in Urbana, Illinois, in the year 1997." "Boneyard Creek is a 3.3-mile-long waterway that drains much of the cities of Champaign and Urbana, Illinois. It is a tributary of the Saline Branch of the Salt Fork Vermilion River, which is a tributary of the south-flowing Vermilion River and the Wabash River. The creek flows through the northern sections of the campus of the University of Illinois at Urbana-Champaign. The newsletter of the university's Associated Colleges of the Midwest chapter is Banks of the Boneyard, named after the creek." The one man show HAL 9000 is performed at the Shubot in the next century (3013) in an effort to resurrect Calculon's fading acting career, and was attended by FUTURAMA series regulars (and devoted Calculon fans) Fry, Leela, Bender, Professor Farnsworth, Hermes, Zoidberg, and Amy among others. "Worst play in history." - "Theatre to be demolished to remove stink of new show." - "12 audience members hospitalized for boredom, 9 of them are going to be okay." Came across this beautiful illustration of Disneyland's MARK TWAIN in obituary notices for the artist Eric Herschong from last year. The artist included smoke coming from the stacks which was never actually seen at the theme parks although escaping white steam would be visible. "Highly talented artist Eric Heschong, who did gorgeous artworks for Walt Disney Imagineering of Disney theme park attractions passed away at 62 years old last Tuesday of lung cancer. 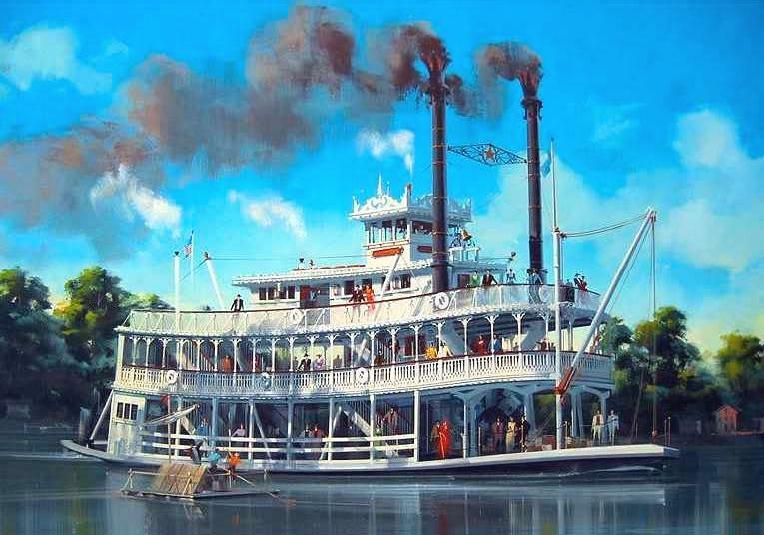 Among other paintings that Eric did for Walt Disney Imagineering there is this beautiful painting of the Mark Twain Riverboat. 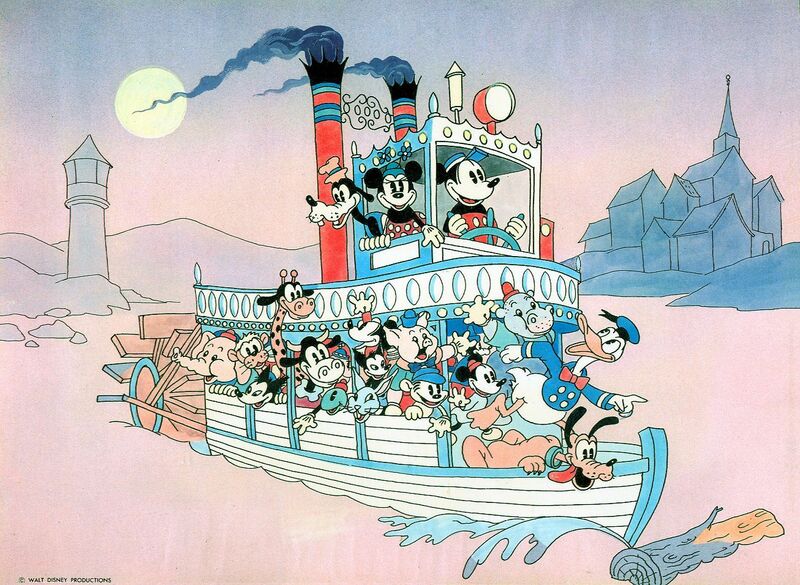 Actually, this one was not an order from Imagineering, Eric did this painting for himself!" Artwork Copyright by Landmark "Eric Heschong & Disney Enterprises"
"Eric started his amazing career painting scenery for CBS and animation backgrounds at Hanna Barbera Studios." 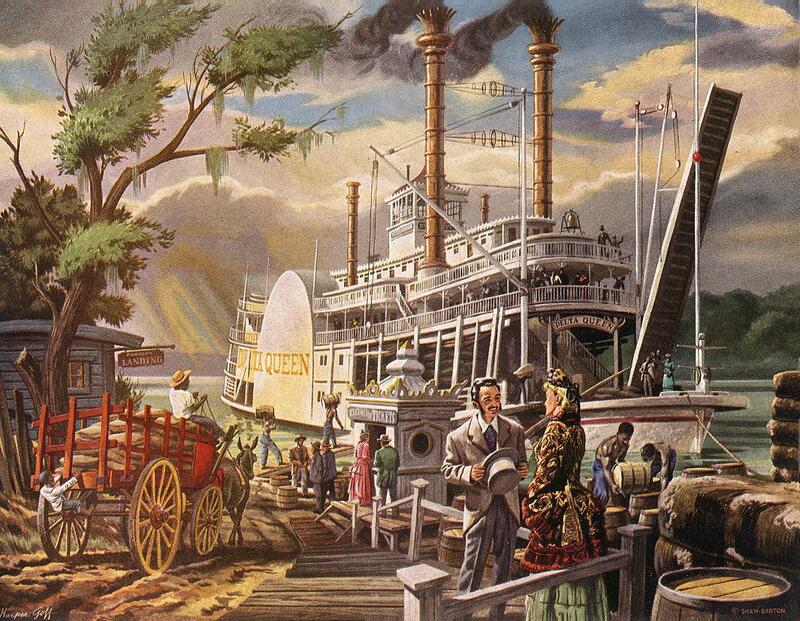 Walt was from Marceline, Missouri and he obviously had a fondness for Mark Twain and riverboats. 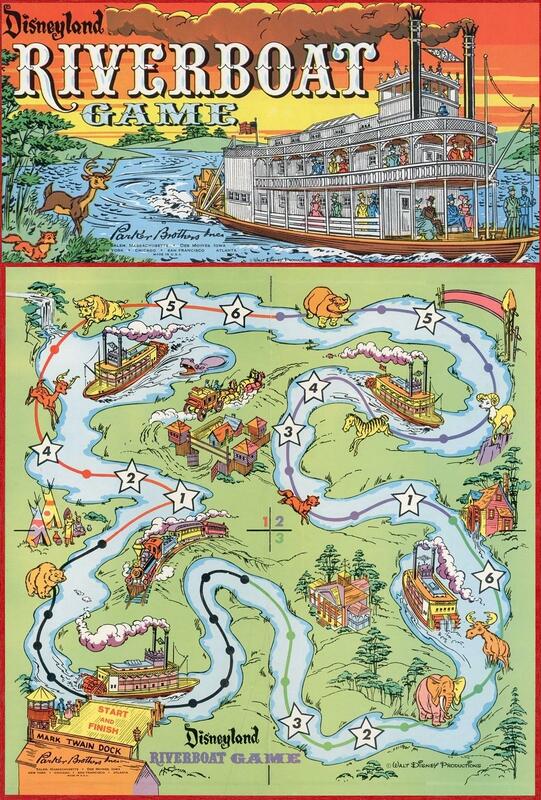 Attached composite of scans of Parker Brothers' 1960 Disneyland Riverboat board game. Board when open measures 14.60 inches square. In the cover illustration the boat has no name but it must have been based on the MARK TWAIN although the drawing is far from being an exact depiction of the boat. In the lower left corner is a sign "MARK TWAIN DOCK" on the roof of a building next to the wharf. This version of the "Rivers of America" has an island in it but it differs from TOM SAWYER ISLAND. Vignette graphics depict things that are on the island such as Fort Wilderness and "Harper's Mill." Wild critters from both Frontierland and Adventureland have wandered into the territory along the river including a buffalo, rhino, deer, zebra, big horn sheep, bear, moose and an elephant. The Indian village and what looks like The Haunted Mansion (which didn't open to the public until 1969) are included along with the railroad whose tracks surrounded Disneyland. A Gambia Islands collector's stamp from Disney, for International Youth Year, 1985: Mark Twain's "Packet Landing at St. Louis from LIFE ON THE MISSISSIPPI with Mickey Mouse, Donald Duck and Goofy in the foreground and yet another recycling of Cornwell's ROB'T E. LEE from the racing painting with the NATCHEZ. This was done in a faithfully cartoony in style and the influence of Dean is evident from the low angle perspective and details of the boat's stacks and 'scape pipes etc. "The Gambia" is the smallest country in Africa and is located on the Atlantic coast in the northwest area of the continent. This presentation is 4 x 5 inches with a perforated rectangle around Mickey and the paddlebox of the "Bayou Belle" that could be extracted and used as legitimate postage. Other Mark Twain novels were also given this treatment. I was made aware of the project when the artists in Disney's "Character Merchandising" department were developing the project. I was given some photocopies of the original black and white drawings which were eventually all painted in the same style as this one. 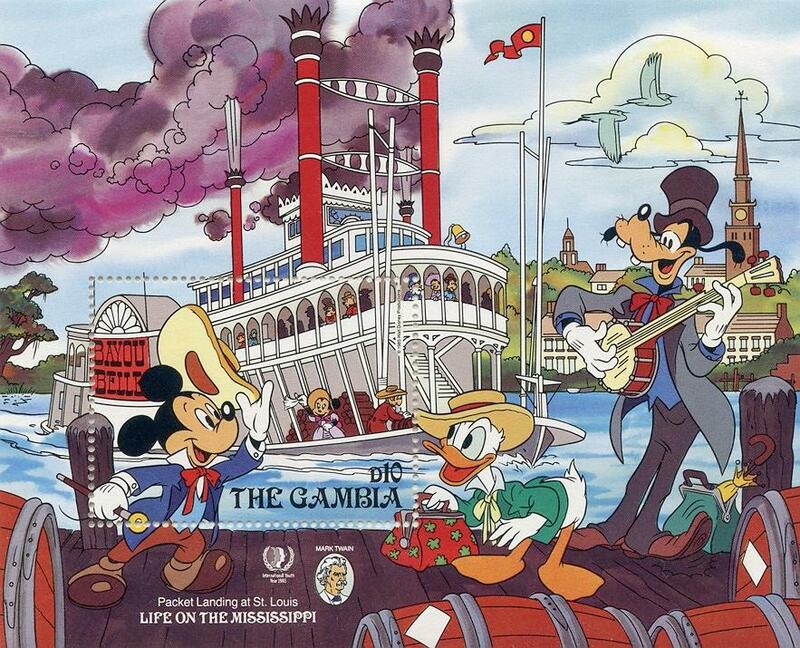 Mickey Mouse "In the Pilot house of the "Calamity Jane"
"Packet Landing at St. Louis" from LIFE ON THE MISSISSIPPI with Mickey Mouse, Donald Duck and Goofy in the foreground and the steamboat "Bayou Belle" influenced by Dean Cornwell's ROB'T E. LEE from the racing painting with the NATCHEZ. "The Gambia" is the smallest country in Africa and located on the Atlantic coast in the northwest region of the continent. This large presentation measures 4 x 5 inches with a perforated rectangle around Mickey and the paddlebox of the "Bayou Belle" that could be extracted and used as legitimate postage. Other Mark Twain novels were also given this treatment for the 150th anniversary. I was made aware of the project when the artists in Disney's "Character Merchandising" department were developing the project. One of them gave me some xeroxes of the original black and white drawings which were eventually all painted in the same style as these. I gather that some or all of the art work, music, dialogue and sound effects have been enhanced in this new version but so far it's unavailable to look at online. Here's a link to a good quality video of the original cartoon on YouTube: Youtube.com. Attached is a scan of the graphic off a promotional T-shirt that I bought on eBay which I've reduced small enough that you won't have to reduce it any more to add it to the museum when the time comes. 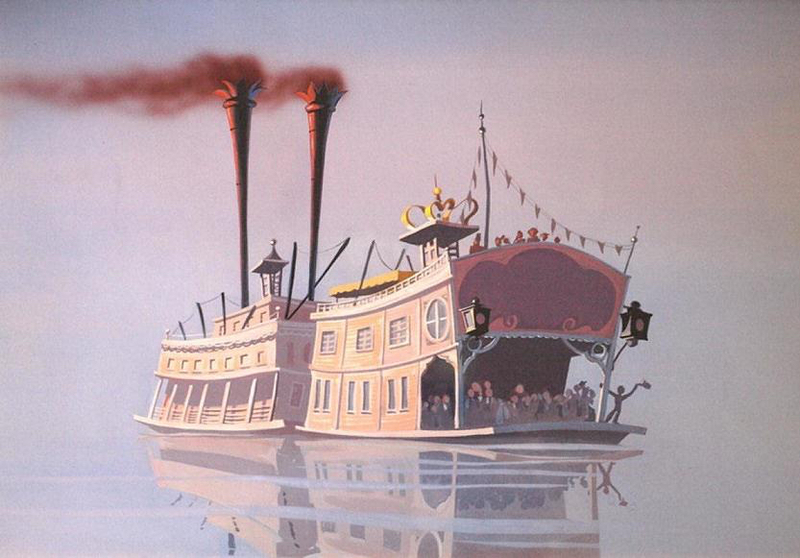 Charming stylized Showboat pushed by a Towboat: original painted Disney animation background 9 1/2 X 13 1/2 inches. We believe this was made for a Chip 'n Dale cartoon "shorts" program. Attached steamboat calendar art painted by motion picture art director Harper Goff (1911-1993) for Shaw-Barton publishers circa the '50's. Harper designed the Victorian submarine NAUTILUS for Disney's 1954 film version of Jules Verne's 20,000 Leagues Under the Sea. I'm not sure why Harper chose to name this big sidewheel packet boat the Delta Queen but it may have been a tribute to the DQ after Harper had taken a cruise aboard her which is likely but I'm not certain if and when he did so. My late friend Tom Scherman (1940-1995) was an expert on the subject of Goff's NAUTILUS submarine and Tom made many scale models of it and was the interior designer of the NAUTILUS submarine attraction for Euro Disneyland (Paris, France). I met Harper several times and had dinner with him, his wife and Tom Scherman at DuPar's one evening in Studio City years ago. Harper also played banjo in Disney artist Ward Kimball's "Firehouse 5 plus 2" jazz band. Harper was given a number of entertaining cameo acting roles in some of the movies that he did art direction for including 20,000 Leagues Under the Sea, Detective Story, The Vikings and Pete Kelly's Blues. Disney Imagineering put on a retrospective exhibit at their Glendale facility of Harper's career in movies, commercial art, fine art and theme parks in the '80's. A great many original pieces of Harper's art work were on display at the show which included drawings, paintings and designs for special props and set pieces. I spoke to Harper at that exhibit about his art directing and his cameo appearance as a banjo player in the 1955 film, Pete Kelly's Blues (in which the steamer General John Newton appeared during the opening sequence filmed on a Louisiana bayou) which Jack Webb directed and starred in. Hardie Gramatky was the author and illustrator of a number of children's books, including the award-winning Little Toot series. "My parents . 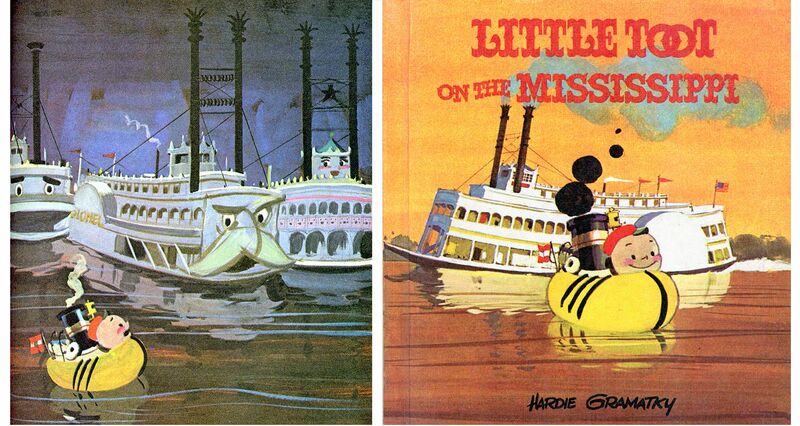 . . loved the bayous of the Mississippi, so when it begins to flood, Little Toot sets out on a daring rescue! Everyone loves the personification of the old steamboats and paddle wheelers who floated down the river." One of his daughter Linda's favorite illustrations is the page 27 with Little Toot in front of the Tower of London. Linda's favorite illustration in this book is page 19, where Little Toot thought that the huge striped "candy sticks" in the Venice canals looked delicious. Linda said that her Dad really captured the "painted ladies", the wonderful Victorian houses on page 23 that overlook San Francisco Bay. Shortly before Linda's father died in 1979, one of the last things he did creatively was to ask her to take down his dictation of the final version of the Loch Ness book that he had been lying there thinking about. "After he died and we showed the manuscript sketches to Putnam editor and president of Young Reader Books, Margaret Frith, who said that "Hardie's sketches are more finished than some illustrators' final art" and we decided to one day try to finish the book. My mother added a couple of illustrations (she was a published artist herself) and I edited all the manuscripts into a final book. Shelley Duvall turned the book into an animated feature of her Bedtime Stories show on Showtime. The show even got an Emmy nomination, so we felt that Dad would have been happy with the results." In what I think is Walt Disney's most beautiful animated feature PINOCCHIO (1940) there are two sidewheel steamboats, both with stacks side by side in the manner of our favorite Inland Waterways boats. The boat on the left transported gullible, foolish boys who are lured to "enjoy" for one night the perverse excesses of an amusement park on "Pleasure Island" off the coast of Tuscany where they are encouraged to misbehave as much as they like by vandalizing property, smoking and fighting. As a result of their night of debauchery the boys are transformed into donkeys who are then rounded up by sinister dark figures who nail the donkey/boys in crates; put them aboard the boat on the right and transported from Pleasure Island back to the mainland where they are sold to salt mines and circuses by the ringleader of the operation, "The Coachman." The latter characters appears to have been based on Charles Laughton's character, Sir Humphrey Pengallan who led a gang that lured ships at night onto the rocky shores of Cornwall in order to salvage their cargoes in Hitchcock's 1939 motion picture JAMAICA INN. The marionette without strings called Pinocchio longs to become a "real boy" and after engaging in excesses on Pleasure Island he begins to transform into a donkey (beginning with long ears and a tail) but is rescued from the island before the he can transform further by his loyal "Conscience" Jiminy Cricket. The blu-ray edition of PINOCCHIO is spectacular - the Technicolor is enhanced and the images refined and sharpened brilliantly - it's a feast for the eyes. 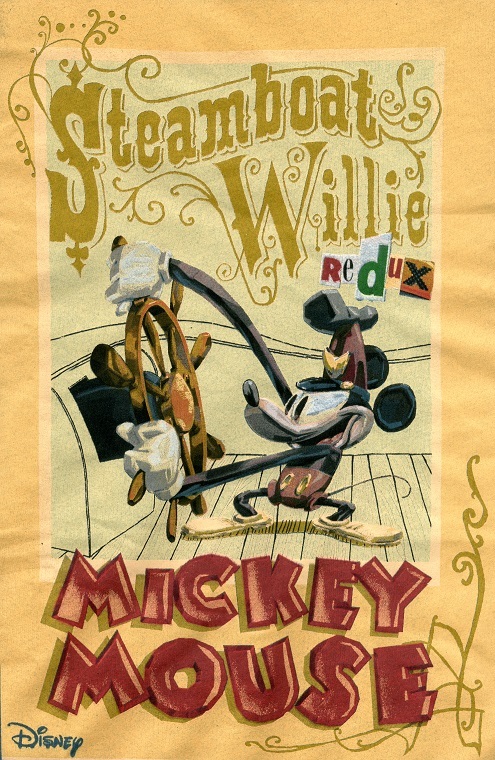 The protagonist characters are endearing and charming and the villains humorous but menacing, the voice actors perfect including Cliff Edwards (a native of Hannibal, Missouri) as the key character Jiminy Cricket, who is the narrator and sings what became Disney's signature song "When You Wish Upon a Star." I remember the Toot episode of the Disney animated feature "Melody Time" very well, even as a little kid I could appreciate the great visuals, animation and music. The two animated sequences about Johnny Appleseed and Pecos Bill are my other favorites from "Melody Time." 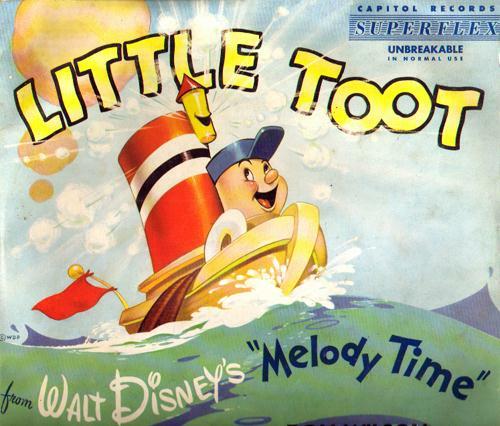 Attached from your Dad's company Capitol is the sleeve for the first children's record of Little Toot which came out in 1947, the year before the movie was released. From Disney's Melody Time (1948)- 07 "Little Toot"
Sung by The Andrews Sisters (Laverne, Maxene and Patty). Won't you ever grow up Little Toot? And as he puffed an S.O.S. Can't you hear that cheering crowd? You are now a Big Toot, Little Toot! "Hi yo Silver . . . Away!" 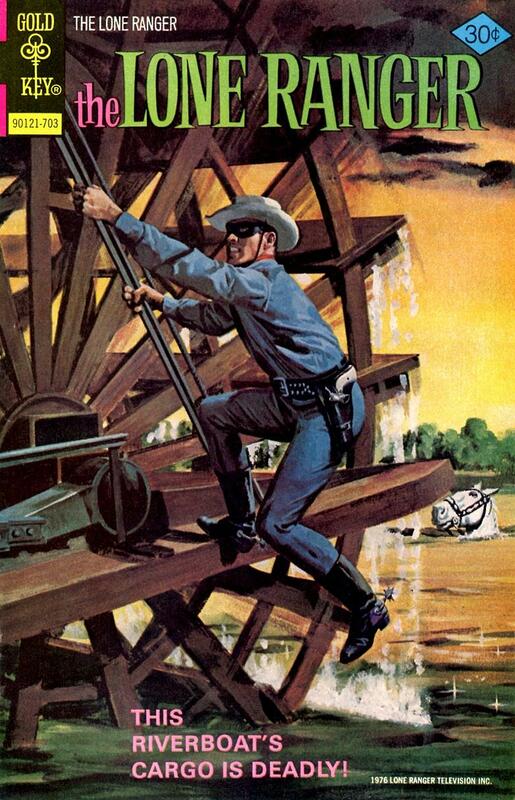 Cover of THE LONE RANGER #28 March 1977. GOLD KEY COMICS. "The Smugglers." Faithful horse Silver is swimming gamely in the distance far right as the Ranger gamely climbs aboard the fantail of the MISSISSIPPI BELLE. In the comic this particular stunt doesn't appear in the story line. 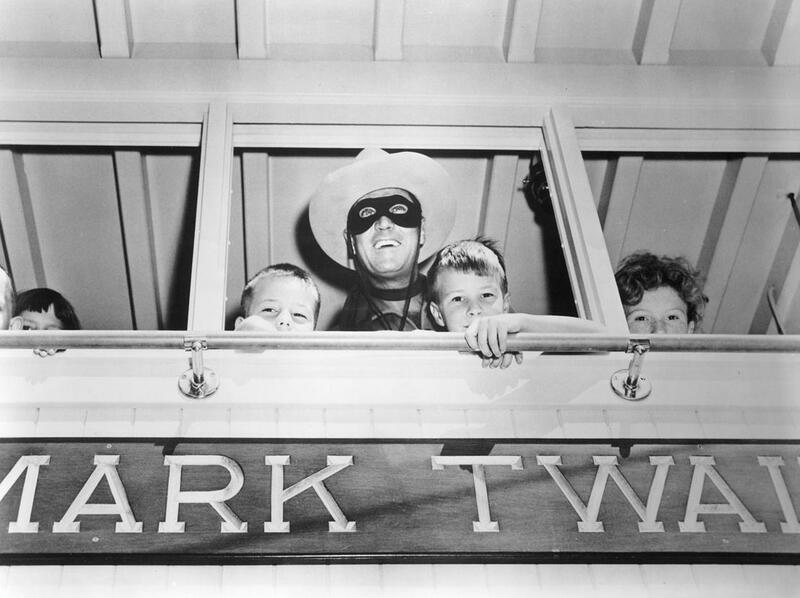 Also included is a publicity photo of Clayton Moore as the Lone Ranger in the pilot house of the MARK TWAIN at Disneyland. Disneyland opened in 1955 when Moore was in the 2nd year of his second and last RANGER TV series (1954-57). It's possible this photo was taken with these five children (the first youngster is barely visible on the far left) on opening day July 17, 1955. "Colonel Parkman"/"Steamboat On The River". "The Triangle" gang is trying to sabotage the transcontinental railroad by attempting to blow up a steamboat that is bringing badly needed blasting powder to the construction site.